Home The Agents Voice is Loud – Leaders are you Listening? 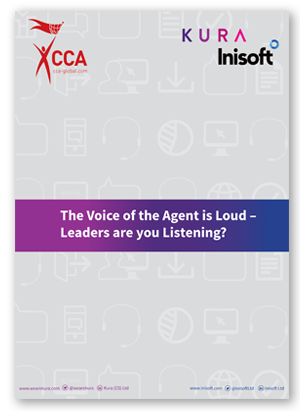 The Agents Voice is Loud – Leaders are you Listening? Kura and Inisoft recently teamed up with ContactBabel and CCA Global to understand the challenges in the contact centre from a leader and a contact centre advisor’s perspective. •	86% of agents believe they have the correct skills to do their job well, and 56% believe their job makes good use of their skills and abilities. •	Only, 53% of team leaders feel they receive regular training and development to support them as team leader. •	34% of agents don’t feel valued as an employee. •	And from a senior executive’s point of view, 64% agree that more could be done to understand employee feedback. Fill in the form below and download your complimentary copy of this summary report now.